The guttiest pitching performance I have ever seen. 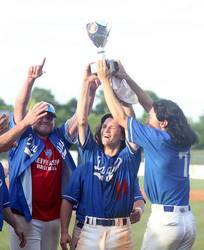 It's only been a couple of days since the Jefferson Dragons won the 4-AAAA state baseball championship. The glow is, of course, still there and will remain for quite some time. There were several distinct reasons for the Dragons pulling off their incredible run to the state title. The big wins over Blessed Trinity will always remain a highlite of the season. The tremendous four-hit pitching performance by Lane Watkins in a 2 - 0 second game win in that series was BIG. The everyday position players like Zac Corbin, Billy Finch, Justin Cole, Ryan Godfrey, Sammy Elegreet, Mason Cooper, Kade McNally, Colby Clark, and Clayton Jones played hard and with a goal of advancing the team as far as their abilities would allow them to go. In the game 1 finals against Cartersville, the Dragons got an excellent pitching performance from one of the smallest in height and weight players on the team. Patrick Hickox continued his team pitching leadership role with a 7-hit, 84 pitch performance in the first state playoff game. The Dragons held on despite 4 errors to win a thrilling 5 - 4 game. The second game was a throw-a-way game for the Dragons as 10 walks, 3 hit-batsmen and 7 errors contributed to an easy 9 - 3 win for the Cartersville team. Coach Tommy Knight said after game 2 that his team performed better when their backs were to the wall. Well, the Dragons did have their backs to the wall as the final game started up in Rome at the beautiful and huge minor-league stadium of the Braves minor-league affiliate. I had mentioned earlier on Facebook that all the Dragons had to do to win this final game was to throw strikes and play defense. This turned out to be one of my luckiest guesses of all time in second guessing and predicting wishes just for the fun of it. The Dragons jumped on Cartersville in the first inning for 5 runs. With the first two-games-of-a-series pitchers "used up" the Dragons went with a reliable third starter. While Junior Vinny Farley held the hard-hitting Panther team hitless, he had control problems with a couple of hit batsmen and walks. Will Wood in relief, pitched well, but also had control problems with a hit batsman and a couple of walks. Then, Coach Tommy Knight rolled the dice. Knowing that Patrick Hickox had only 36 pitches left to use up his 120 allowed in the state tournament, he called upon the scrappy little left-hander to come in and at least put out the fire. I don't know how many Jefferson pitchers, if any, have ever faced the pressure that Patrick Hickox was under as he trotted onto the field in Rome that night. Entering the game with one out and two runners on base, Hickox went to work. He threw a strike, a ball and then 6 straight strikes to retire the side and keep Jefferson at a 5 - 2 lead with 3 innings left. He had used only 8 pitches in those two-thirds of an inning. The bottom of the fifth saw him throw 2 straight balls, 3 strikes, a ball and then retire the side with 2 more strikes. He had thrown 8 more pitches and now had only 20 pitches left for the final 2 innings. The sixth inning was another scoreless inning for the Jefferson leftie as he threw 8 strikes and only 2 balls for 10 total pitches. He now had 10 pitches left for the final inning. I'm sure Coach Knight had a plan in mind in the event he had to yank his pitcher somewhere in the seventh. Heaven and Coach Knight only knows what that plan might have been. Hickox's first pitch of the seventh inning was a ball, his second a long home run from a Cartersville player that is headed to Florida on a baseball scholarship, Anthony Seigler. Then, Hickox went back to work. His next 7 pitches were strikes that resulted in two outs. Now only one out was needed to give the Dragons that long awaited state championship. Now Coach Knight knew that it was all up to Hickox. He had only 1 pitch to reach his 120 for the state tournament. According to state tournament rules the pitcher gets to complete an at-bat once a pitch is thrown to a batter, so the next batter was going to belong to Hickox regardless of how many pitches it might take to get him out. Hickox didn't fool around with the batter. He threw the ball in the strike zone where a sizzling grounder was hit to third baseman, Lane Watkins, who threw the runner out at first. Hickox had thrown a ball and 9 straight strikes to retire the Panthers in the bottom of the seventh inning. He had used up all of his 120 allotted pitches for the 3 game championship series. The Jefferson Dragons had their first baseball state championship with a 6 - 3 win in game 3. In 3 and two-thirds innings, Hickox had thrown 36 pitches, 29 for strikes. This borders on unbelivable. 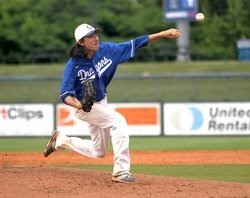 In this pressure-cooker with everything on the line, the young Dragon pitcher had displayed the guttiest pitching performance I have ever seen by a high school pitcher. The remarkable 2018 State Championship season for the Dragons will forever be etched in stone. For me, the remarkable pitching performance of a scrappy, determined, relentless and unflinching little left-hander will always remain as my benchmark as to how the Jefferson Dragons clinched a baseball state championship in 2018. The Jefferson Dragons completed the 2018 season with 28 wins and 12 losses. They won the Region 8-AAAA title. In the state tournament they defeated West Hall 2 games to 1, Northwest Whitfield 2 games to 0, Woodward Academy 2 games to 1, Blessed Trinity 2 games to 0, and Cartersville 2 games to 1. Control personified . . .
Patrick Hickox delivers another strike.